Yes, you read that right. I could talk for days on how to get your perfect wedding dress, but how about a little love for the handsome suits out there! 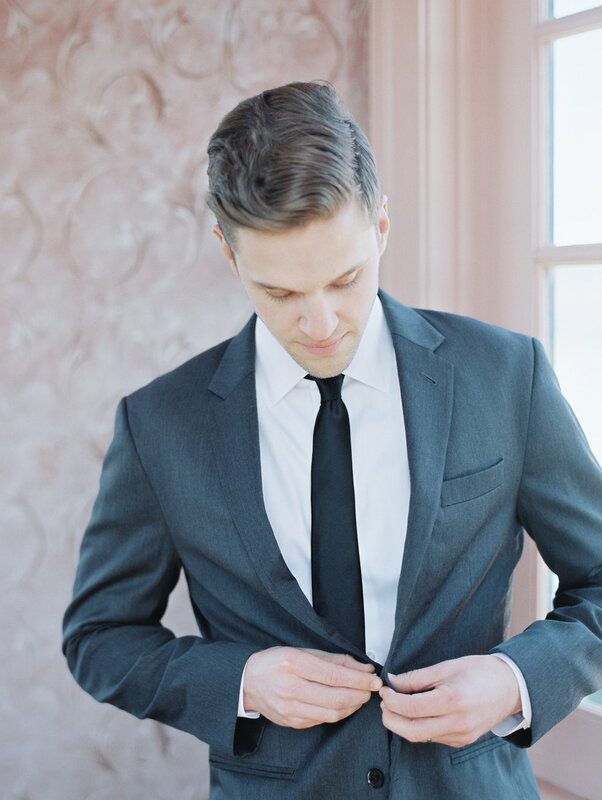 Whether you yourself are looking for some advice on getting the right suit, or you’re on the hunt for the right look for the wedding party, this post will give you ALL you need. A fitted and well cared for tuxedo or suit will make a world of a difference to the style and elegance of the wedding day. Sure, the decor might look nice, and the dress might bring to you a lot of compliments, but if the guys aren't put together the photos will look unprepared or unfinished. So today I want to give you five of my best tips to avoid any mishaps and take your gorgeous event to the next level! A blue suit might be trendy, and a tuxedo is such a classic look, but if it doesn't fit the vibe of your wedding or blend with your chosen colors well enough, you are going to stand out rather than compliment! Find two options that would work for not only the style of your groomsmen, but your wedding as well and make your final decision based on availability (or whatever your heart jumps to)! No matter whether you purchase or rent, you're going to want to know your size. And more importantly, anticipate your size for your actual wedding day! Planning on losing weight? Bulking up? Before renting or getting your final fitting, know what you're actually going to weigh. If you can go the extra mile, get yourself measured at a tailor or local formalwear shop. Not gonna happen? I highly recommend renting from The Black Tux, where they use an algorithm to help you find your right size without the fuss of tape. If you're in the Portland area, you'll now easily be able to see their material and find the right look for you with their newly opened showroom on NW 23rd. The space is laid back, but still brings an element of sophistication. The showroom associates themselves are highly knowledgable and have done a great job of creating a community with their client base, without being pushy or out of touch. Ladies, if you’re also looking for a suit, Black Tux has such versatile sizing that they still recommend their suits for women as well. If you’re loving the Black Tux vibe but wanting something a little different, Anthropologie does parter with the Black Tux and they have a beautiful option that balances feminine and masculine styles really well. Check it out! This advice applies to EVERYTHING when planning a wedding. Get your dress, your vendors, and your venue as soon as possible. Although some rental shops and online stores ship out two weeks before the wedding, it's ideal to set your rental date asap so you can guarantee the suit you actually want. If you wait too long, either your fit or style will be gone, or there won't be enough for your number of groomsmen. As soon as you know your style, I say start shopping around! Despite what you might be thinking now, there are actually a lot of ways for you to add in your personal flair to your suit without overwhelming the look. The best example of this is your socks! Each groomsman can choose his own look, or you can coordinate based on favorite sports team or style and pattern. These days lapel pins are their own statement and there are so many options to choose from! Here is another opportunity to either match your groomsmen, or allow each to make his own decision, appropriate to the wedding of course! You can keep going from here: ties, boutonnieres, watches, and pocket squares are all opportunities to add in some flair!